The end of the school year is so full of ceremonies, parties, and silly photos that it all goes by in a whirlwind. 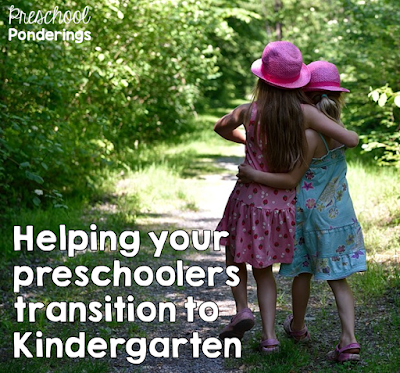 This is an overwhelming time for any preschool teacher, but it's even more overwhelming for those little ones. They keep being told that next year they'll be a big kid and go to kindergarten, and from their perspective, that's a lot of unknown. What will their new school be like? Will their new teacher be nice? How will they get to school? Will they get to see their friends? Do they still get to play with their favorite toys? Where will they keep their things? All of these questions are swirling around in their heads, making this time - which should be a celebration of how big they've gotten - just a time that they don't really want to come. These are the days when one-on-one time, answering questions, and lots of extra love are the most important things. Take time to read favorite stories, reassure them, and let them know how proud and excited they can be. Look at things that they've completed this year, and talk about their fears. Have large group conversations about the kinds of things they might encounter in kindergarten and role play scenarios with them. While it's important to answer all of their questions confront their fears, it's just as important to keep your same routine and still do all of the things that they love the most - special art projects, fun dramatic play, lots of outside time, and silly songs. Take time to enjoy each other and make sure that school is a place where they can forget about their worries and fears for a while! What are your favorite things to do at the end of the year in order to get your kiddos ready for Kindergarten?